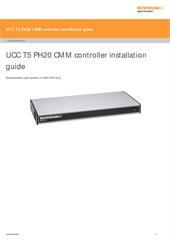 The UCC T5 must be used in conjuction with a Renishaw SPA3. Setup and commisioning should be completed through Renishaw's UCCassist-2 software. The UCC T5 has replaced the UCC2 and 5-axis daughtercard. It also replaces the TEC card and provides support for 16 channels of temperature compensation. The UCC T5 uses an external power supply and manges full control of the PH20 head, CMM and probe signals and communicates with the CMM's computer.